The Elegant Campus of Scripps College, Claremont, Calif.
Scripps College is a repository of 1930s architectural and landscape elegance. For example, its grand allée of American elms, designed in the early 1930s and planted in 1939, has framed college graduations since 1947. 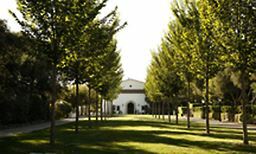 Selected for inclusion in the National Register of Historic Places in 1984, Scripps College received a Getty Campus Heritage Initiative Grant in 2002. Image: Scripps College, Claremont, CA.